The Dodgers have a problem — a huge problem. LA has a flaw that a few other clubs seem to have during in-game management. Put simply, the Dodgers think too much. With the modern baseball philosophies leaning towards short starts, heavy bullpen usage and gigantic analytics departments, the Dodgers are no different than a lot of other MLB teams. They rely heavily on numbers and less and less on common sense. It’s an illness that is slowly infecting baseball and it’s costing the Dodgers baseball games. Sure the numbers may prove accurate over the course of a long season but during a single game they can hinder a team from doing what they should be doing which is making the logical move. Common baseball sense still goes a long way and that’s never going to change. The Dodgers overthink and at times do it to their own detriment. Let’s discuss Tuesday evening’s infuriating 16-inning 7-4 Marathon loss. The Dodgers have another problem. They’re short on middle relievers. Their short start philosophy has caused them to overuse their own bullpen leading to four of their middle relievers landing on the disabled list. For the record, Pedro Baez is due back on Friday when the Dodgers travel to Atlanta to play the Braves, but he wasn’t available on Tuesday night. Sure, you may think it’s just a coincidence that four of the Dodger’s primary middle relievers all had injuries befall them at the same time, but I assure you that it is not. If you’re going to march out 8 relievers per game over the course of the final 4-5 innings of a baseball contest every single night then you’re going to burn out your bullpen faster than Manny Machado can hit a baseball over the fence. With this type of bullpen usage guys are going to get hurt and by the end of the season you’re going to have a major issue. With all of the middle relievers out with injuries the front office has acquired a bunch of journeymen to get them through the schedule until the main guys return from the disabled list. They’re not terrible mind you but they’re just guys and can be very inconsistent at times. One minute they’re striking out the side, the next they can’t get anyone out. Again this is another example of overthinking. The Dodgers believe the data tells them that a starting pitcher’s performance gets worse when he faces an opposing lineup a third time through. Maybe that’s correct, but again you have to judge each game on an individual basis. If a starting pitcher is pitching well and getting guys out and his pitch count is under control then there is no reason to take him out of the game. There’s no reason to remove a starter just because the stats say so. You don’t have to go to the bullpen just to go to the bullpen. So there was Kenta Maeda on the mound on Tuesday night. Entering the seventh inning, he was pitching well and his pitch count wasn’t too high. It made sense to let him pitch, or let him start the inning and have someone throwing behind him in case he got into trouble. That’s just what Dave Roberts and the Dodgers did. Only one little hiccup — the Dodger’s middle relief isn’t very good. Roberts, of course, knows this. I’ve noticed that he has been sticking with his starters a little longer than normal over the last couple of weeks. He did that on Monday with Ross Stripling and again with Maeda. So when Maeda began to tire and the Phillies started to hit him Roberts stood his ground and left him in to try and work out of the inning. It’s a direct result of the flawed philosophy of lengthy bullpen usage. It all correlates. Flash forward to the sixteenth inning. The Dodgers had used up all of their relievers (with the exception of Caleb Ferguson who was not allowed to pitch because he tossed three innings on Sunday) and were down to just their starters. They had Rich Hill run out to the bullpen to begin to warm up. Since starters pitch bullpen sessions between starts, and Hill is not scheduled to pitch the next day and they literally had nobody else available to pitch, you could reason that this was the logical choice. You let Hill pitch the bottom of the sixteenth and hopefully the bats score in the top of the seventeenth. Once again the Dodgers overthought the situation. Instead of bringing in Hill they had Enrique Hernandez pitch the bottom of the sixteenth and the results were predictable. The position player who had never pitched professionally before gave up a walk-off home run to the last player on the Philadelphia bench (Trevor Plouffe), a guy who has barely played this year. The game was over in minutes. Take note that the Phillies made the logical choice and won the game because of it. 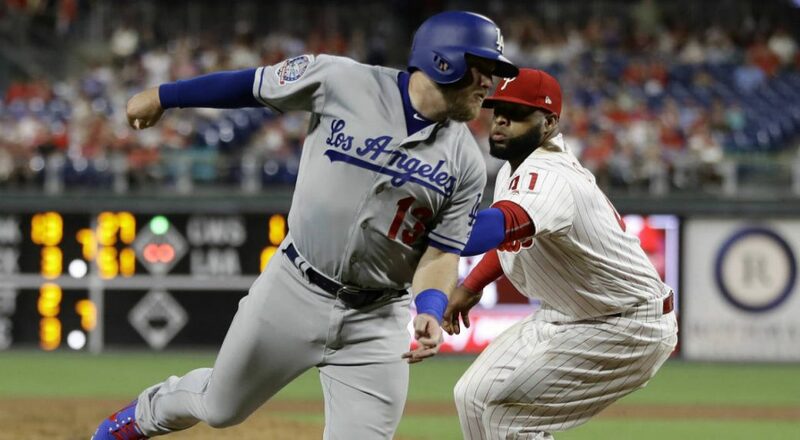 They brought in a starting pitcher (Vince Velasquez) to pitch the top of the sixteenth and the Dodgers were held scoreless. Analytics are great but common sense is priceless. The Dodgers just need to stop overthinking so much and practice a little common sense. It would go a long way.